Neven Mimica is a Croatian politician and diplomat, currently holding the position of European Commissioner for International Cooperation and Development. During his career, Mimica has held many public office positions. From 1987 to 1997, he was in diplomatic service of the SFR Yugoslavia and Croatia holding posts of Minister-Counsellor at the Embassy of Croatia in Cairo (1993-1996) and Minister-Plenipotentiary at the Embassy of Croatia in Ankara (1996-1997). He was then Deputy Minister for Economic Affairs (2000) and acted as Chief Negotiator for the Stabilisation and Association Agreement with the European Union (2000-2001). He served as Minister for European Integration (2001-2003) and, after the general elections in 2003 he became the Chairman of the European Integration Committee in the Croatian Parliament. He was re-elected to the Croatian Parliament in 2007 and between 2008 and 2011 he was the Deputy Speaker and the Chairman of the European Integration Committee. From 2011 to 2013 he was the Deputy Prime Minister responsible for Internal, Foreign and European policy. In July 2013 he was appointed as Member of the European Commission for Consumer Policy. 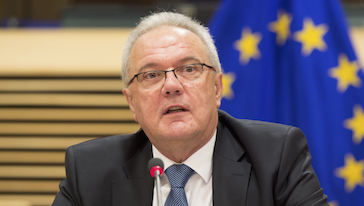 Neven Mimica holds a Bachelor’s degree in Foreign Trade and Master’s degree in Economics from the University of Zagreb.